We've moved to our own domain! Come see us for new posts, food tidbits and great recipes at The Dutch Table. In several days time, on January 29th, Holland will be the scene for another highly culinary event: the annual Frikandellen Eating competition. Held for the seventh year and hosted by the Men's Choir of Heukelum, a small town in the province of Gelderland, twenty contestants will compete for the challenge trophy and, oh joy, the Golden Frikandel. Gelderland is no stranger to interesting sausages: it is supposedly the birthplace of Gelderse kookworst and rookworst. In Dutch, worst means sausage which may, on the whole, not be totally coincidental, as the meat used for many of these sausages is not exactly the best. The Gelderse version is made of lean pork, seasoned with a particular set of spices and slightly smoked over oak and beech, then eaten either cold (kookworst) as luncheon meat or boiled (rookworst) with split pea soup or boerenkool, that lovely wintery dish of mashed potatoes with kale. So what is a frikandel? It's a skinless deep-fried sausage, made of chicken, pork and beef. It can be served by itself or with mayo, in a roll (broodje frikandel) or cut open and doused in mayo, (curry) ketchup and minced onion. 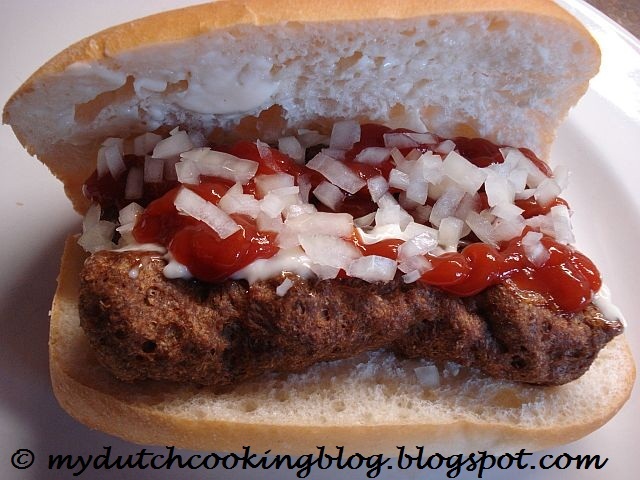 This culinary concoction is called a "frikandel speciaal". 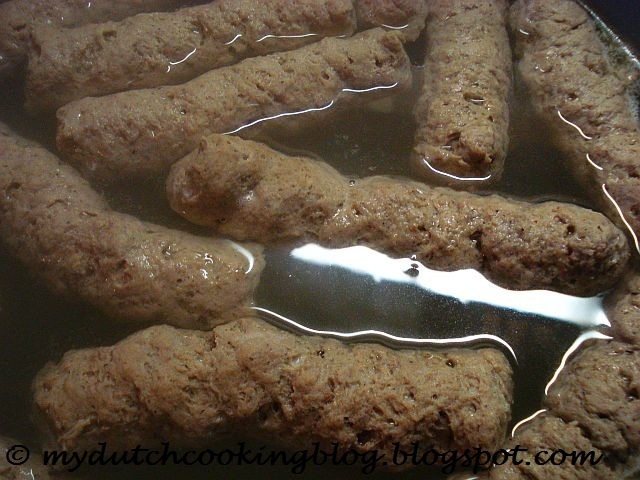 This savory sausage is Holland's number one snack, only every so often bumped off its champion position by number two, the kroket, the big brother of the bitterballen. Fried snacks such as these are traditionally sold in neighborhood "snack bars" or "automatieken", like the Febo. Kroketten, bitterballen and frikandellen are also the top three fried snacks most missed by Dutch expatriates. The first two are fairly easy to make, but I had never tried my hand at making frikandellen until this weekend. It's a bit of a hassle but you'll be surprised at how close to the real thing this recipe is. 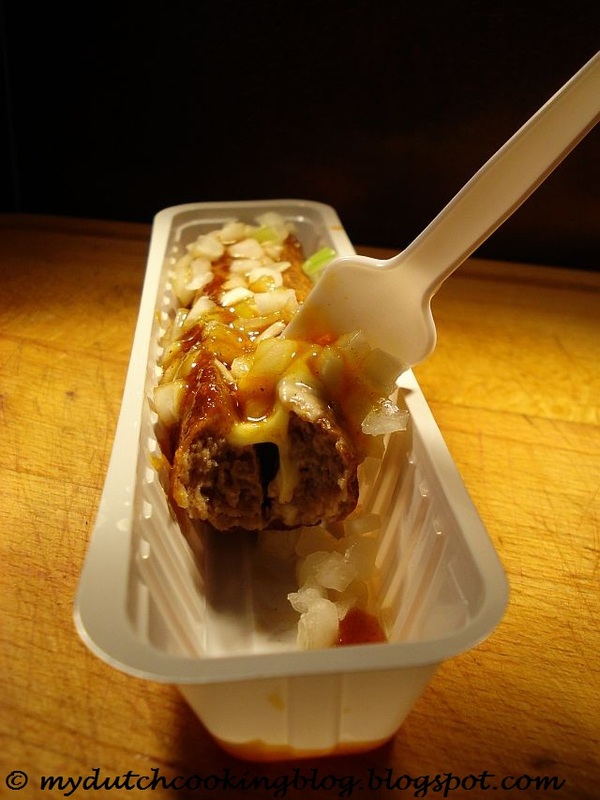 So get your mayo, ketchup and onions ready, because it's time for a frikandel! 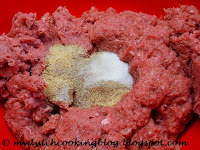 Grind the meat very, very fine and blend together with the spices and the cream. Watch out for the motor if you do this on your food processor, and do small batches to prevent overheating the appliance. the recipe and all the help! Bring a large pan with water to a boil. 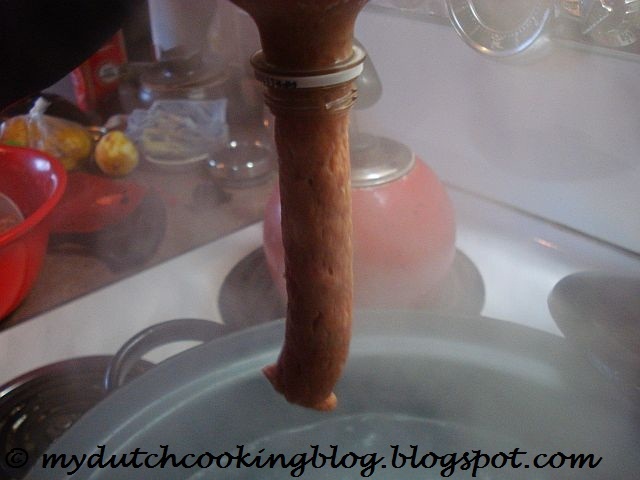 If you have a sausage grinder or stuffer, just hang the end of the tube over the pan of boiling water. If you don't, you can make this contraption to push the meaty mush into a sausage shape: take a 16oz soda bottle, preferably with straight edges, and cut off the bottom. Find a glass or something solid that fits snug inside the bottle so that you can push the ground meat through the opening. You are going to need a lot of strength to do this! Please make sure the pan with boiling water cannot be bumped off the stove and keep kids, pets and impatient eaters out of the kitchen. Safety first! Now fill the bottle with the meat, tap it tight so that there are no air pockets and hold the bottle over the water. Push the meat through the opening and have someone else cut the string of meat every ten inches or so. The meat will shrink at least a third in the water, so the longer the better. Frikandellen measure on average a good seven inches long. Allow the meat to boil for five to six minutes, on a medium boil, then retrieve the sausages and dry them on a cooling rack. Once they've cooled, you can freeze them for future use, or you can crank up the deep-fryer. Straight from the cooling rack, they need about 3 to four minutes in the hot oil (fry at 375F). For frikandellen speciaal you can cut them lengthwise, about 2/3s in, before you fry them. Serve with mayo, with a bun or "speciaal". If you start training now, you might still be in time to participate in the National Frikandellen Eating competition this year. Good luck!! These are the #1 snack, and for good reason. I must say that seeing them float in the boiling water does not look so appetizing, but I guess they look nicely brown after deep frying. I would love to taste your home made Frikandellen, so when ever I travel again, I will let you know in time. This recipe is definitely the closest you can get to the "real" thing in the snack bar in Holland. I highly recommend this to any Dutch expatriate longing for a good frikandel. I at least was extremely excited when I found this recipe a few months ago and was happy to share it with Nicole for her excellent blog. Take a soft white roll (which btw when are you going to cover Dutch soft white rolls on your baking blog? Because the ones you can get here are all just not the right ones :)), cut the roll open, cut the frikandel in half length wise (if you're using a full length frikandel) and cut it open. Then generously douse it with mayonnaise (another one of those things you really need to cover on your blog as there's no good mayonnaise here in the US) and ketchup, then add a generous scoop of diced unions (diced very small). Frankwin, I posted a picture of your broodje. I'll get on that soft roll one of these days, will keep you posted! Ben, do let me know when you'll be in town! Now to see if I can get my mom to mail me a bottle of curry hahah. you can easly order it online in the US if that is where you are at. I just ordered 2 bottles from GermanDeli.com. It's the Hela scharfer curry ketchup.13.5 oz @5.99 each. Hope that helped.Let me know. Shadee, thanks for the message. I know exactly how you feel, I was thrilled to find out it is actually do-able! Let me know how they turn out. By the way, I'm a curry girl too, ketchup just doesn't do it for me. Very nice, my kids like them too, I looked on line by dutch shops but nobody has frikandellen. And now I found it and making them myself. Thank you so much putting this on line. Tried to find this site. No luck at all. Where can I buy frickandellen in the UK ? We lived in Holland for a few years, back in the seventies, and fell in love with it but, since settling in the UK we can find no way of purchasing it. Help, help, help please ! I was in Amsterdam just a week ago, and tried this along with the cheese souffle ones in a Dutch snack bar. They are good! Glad to see the recipes here. Wow. i just made my own bitterballen. now i am gonna do the frikendal. thanks for the recipe and help tips. Ive just bought from Joli Snacks and had 2 with the mayo and curry sauce,not had them for 25 years, just as good as I remembered. Thank you for visiting My Dutch Cooking Blog! You will be able to find this post and many others on our new site, www.thedutchtable.com. On the top of this page you will find a link to The Dutch Table. We would welcome your comments there! Who else is enjoying Dutch food?